It’s never too early to go grey – so bag yourself a slice of this surprisingly chic look with BLEACH London’s subtly smoky shampoo. Adding charcoal grey tones and slatey sheen to light hair shades, this is also enriched with vitamin E to impart softening nourishment to stressed-out strands. Responsible for the maintaining the coolest manes in the capital, you can trust BLEACH to transform your tresses. Charcoal grey is officially chic – and there’s no easier way to channel this trend than BLEACH London’s Smoky Shampoo. 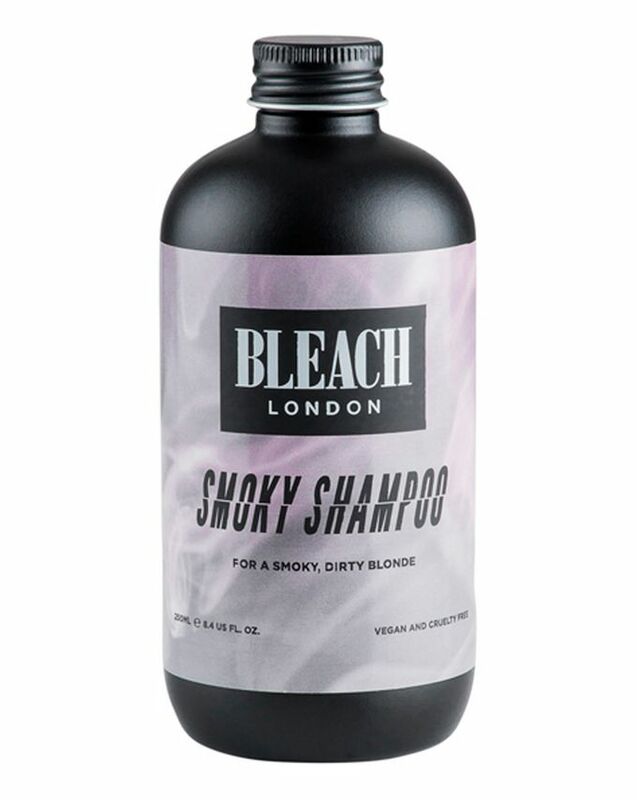 Imparting subtle charcoal grey tones and slatey sheen to light hair (perfect for dirty blondes), this clever cleanser is the perfect way to shake up your look without making a colour commitment. Enriched with vitamin E, the formula offers softening nourishment and, what’s more, like the entire BLEACH line, it’s completely cruelty-free and vegan – what more could we ask for. Lather a generous amount onto wet hair. Gently massage and work through the roots and ends. For a stronger result leave in for 5-10 minutes. Rinse and follow with conditioner. I had crazy-bright, neon yellow hair for a time and, a few months into the fading process it stopped making progress, leaving me with quite a deep golden colour (which isn't bad - but I wanted a change). This shampoo made it a really cool, almost natural looking ashy blonde after the first try. It didn't remove the yellow undertones completely but then again I don't blame it - I used really pigmented yellow dye (Arctic Fox Sunshine + Neon Moon and then a few months later L'Oreal Colorista). I will say, it made the strands that have had the most bleach abuse stark white after 3 shampoos. Really, really cool product. Would recommend to anyone going for a cool/grey toned blonde (but if you're not going for a pretty severe look - try it out without leaving it in first as it is quite strong!). This shampoo really does make your hair a beautiful colour and removes brassy tones completely! The only downside I can think of is that it is very drying shampoo, my hair feels dry after using but I just make sure to condition all of my hair instead of just the ends after usage. I’ve been trying to find an alternative to those purple shampoos for my naturally grey / silver grey hair and this is it. I’ve tried several but none of them deliver the colour tone and look after my silver fox mane like this. Highly recommended. My favourite shampoo for getting rid of ugly yellow tones from my lightened hair. For a start this smells divine! It helps take away the brassiness from my highlights and doesn’t leave a blue tint which a lot of these shampoos do. Used with the Reincarnation Mask, my hair has lost its frizziness and is more manageable. This is awesome! It makes my salt n pepper hair looks smoky hot! Love it and love the smell too. Best shampoo for gray hair. First of all, it smells amazing and the colour so is pretty to look at! It keeps your hair soft and freshes up your grey colour. I used to tone my hair every 2 weeks but now I don't think I will have to tone my hair ever again. This made my old dirty blond balayage look like I just got it re-dyed. Honestly one of the best products I have ever used. Finally I have found something that gives my hair the perfect grey colour and don't even have to spend time or money on dyeing it. I had given up hope, Alchemy, Silver shampoo and Silver conditioner have brought my hair back to its former glory. I am 52. And thrilled, I found the odd silver strand in my mid-forties, Daftly decided to home colour my natural ash blonde hair, then gradually added salon highlights. Menopause hit and it then appeared to have a whole life of its own! Frizzy when it had never been before. Had given up after trying everything going. My hair is now back to its natural texture and colour, So happy, Try it! I loooove the smoky shampoo, it makes toned hair thiscool silvery lilac colour! I can’t stop ordering more! I have long, highlighted hair and been using this shampoo and a conditioner for about 2 months or so, once a week. It really removes all the brassy and yellow tones and gives you that smoky-platinum tone. The only problem, in my opinion, is that it also gives you a green undertone. This is fab but would like this colour perm can anyone recommend a toner or perm colour for this I have pre-lightened blonde hair. Love this!! I had lilac hair but it faded out. This is great between dyes. So far used it with the silver conditioner which makes my hair super soft. Looking forward to using this combo after my next toner as I went 4 days without needing to wash, which when you have pastel colour that really is a good thing! (prolong the life of the colour). My hair is already a grey lilac colour so using this this shampoo keeps it that beauts grey colour! I always wash my hair with bleach silver shampoo, leave this on for a couple mins and follow up with the silver conditoner or reincarnation mask as this doesn't foam up like a shampoo normally does it's almost a pigment but its brilliant!!! !